Immediately south of Murderdean Road bridge and north of the National Mining Museum of Scotland. 1st station (demolished) was on the opposite side of Murderdean Road. Notes: The new station opened on the Borders Railway is about 100yd south of the original station site, and its location is convenient for providing access to the National Mining Museum of Scotland (formerly Lady Victoria Colliery, closed in 1981) by a footpath from the platform. Since the original station closed in 1969 the village has grown significantly, despite the end of coal mining, and has developed as a commuter settlement for Edinburgh. The station is on a single-track stretch of the railway and its platform is east of the line, of sufficient length to accommodate 6-car trains. The facilities are typical of the new stations consisting of a glazed metal waiting shelter, an automatic ticket-issuing machine, CCTV surveillance, and a public address system, digital display screen for train and posters to provide train information. Parking is available for 56 cars and 20 cycles can be stored in a purpose-built shelter. There is a half-hourly train service in each direction on weekdays, and hourly on Sunday. 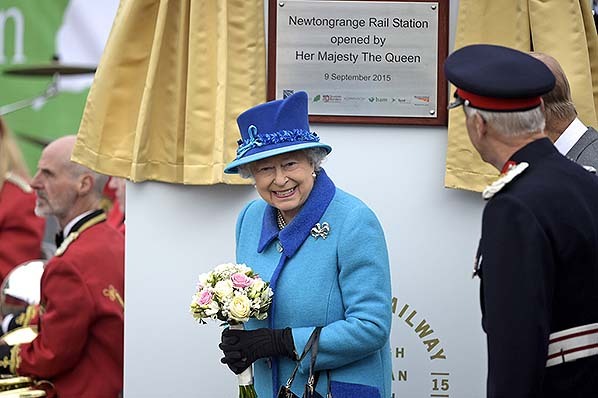 On Wednesday 9 September Her Majesty the Queen unveiled a plaque at the station to commemorate its opening. 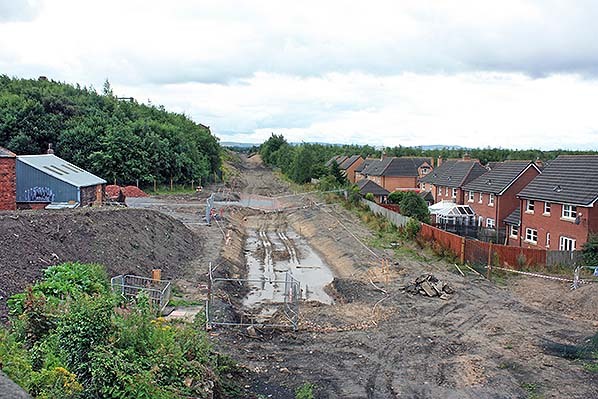 The site of the new Newtongrange station being prepared in August 2013. The headframe from Lady Victoria Colliery (National Mining Museum) can just be seen protruding above the trees. 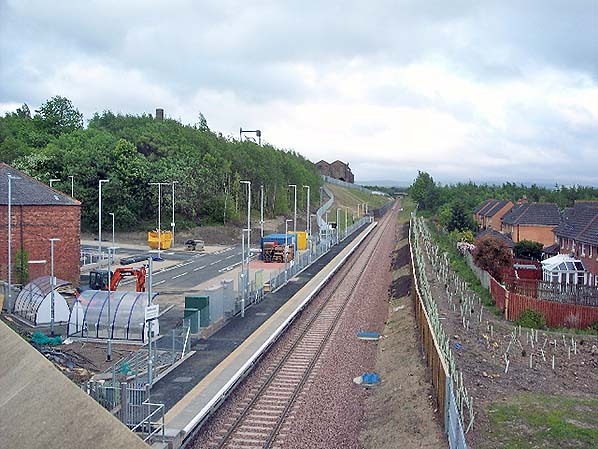 Looking south from Murderdean Road bridge at Newtongrange station in June 2015, four months before the station opened. 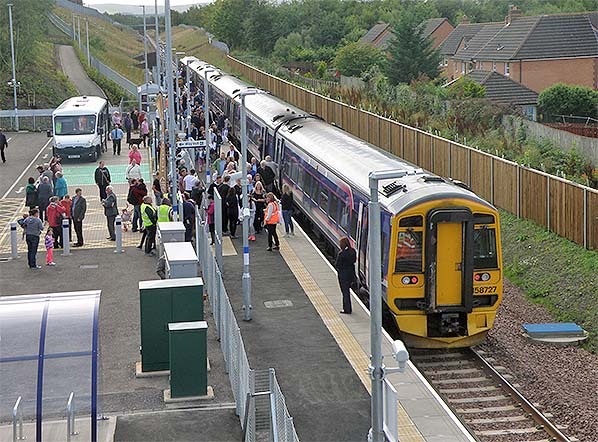 Specially selected passengers were given a free trip the Borders Line to Edinburgh the day before the opening of the line to the general public. The owners of a 'Golden Ticket' traveled on three trains leaving Tweedbank, Galashiels and Stow, each carrying 160 passengers. Others making the trip were nominated by the public or won competitions. One of the Golden Ticket trains is seen at Newcraighall station on 5 September. On 21 October 2015 Class 158 DMU 158 733 is about to depart from Newtongrange at 16.30 for Edinburgh Waverley. The view is southward along the single platform. No-one appears to be taking advantage of the storage facility for 20 bicycles, but some of the 56 car-parking spaces are occupied. The station is expected to handle plenty of Edinburgh commuter and leisure traffic and – as the ScotRail sign indicates – visitors to the National Mining Museum of Scotland are invited to make use of the station. The museum is a few minutes’ walk from the station and is based in the buildings (seen in the distance) of the former Lady Victoria Colliery where mining ceased in 1981. Newtongrange (2nd) station looking north along the single platform in October 2015. The 1st station, closed in 1969, was situated beyond the road bridge, but it has been demolished. 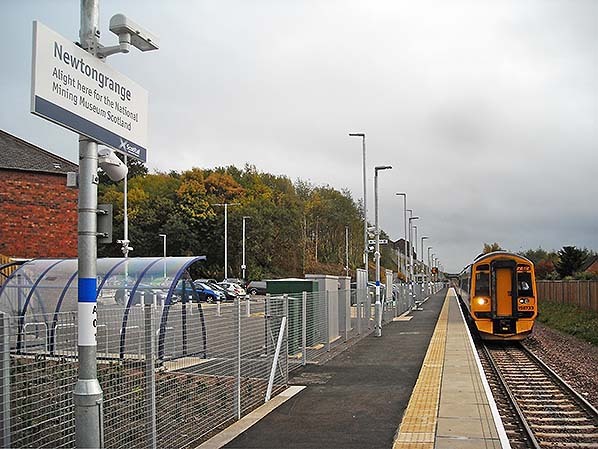 The standard furniture and fittings of the Borders Railway stations are provided at Newtongrange: a glazed metal waiting shelter, automatic ticket-issuing machine, CCTV surveillance, and a public address system, digital display screen for train and posters to provide train information. A car park with 56 spaces can be seen on the right and there is a storage facility for 20 bicycles. The tall brick building in the background is not of railway origin but its back wall is used to display advertisements related to the Borders Railway. 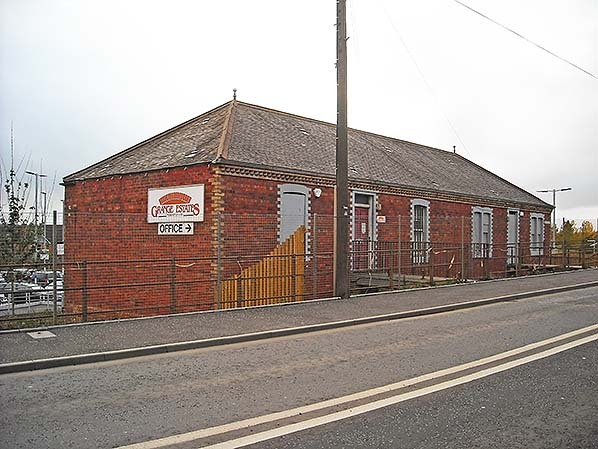 The rear of this building adjacent to Newtongrange (2nd) station is used to display ScotRail advertisements for the Borders Railway in October 2015. The building is thought not to have any former association with the railway, but today its doors have been painted in ScotRail colours. The upper floor of the building seen on a previous photograph, looking south-west across Murderdean Road. In October 2015. 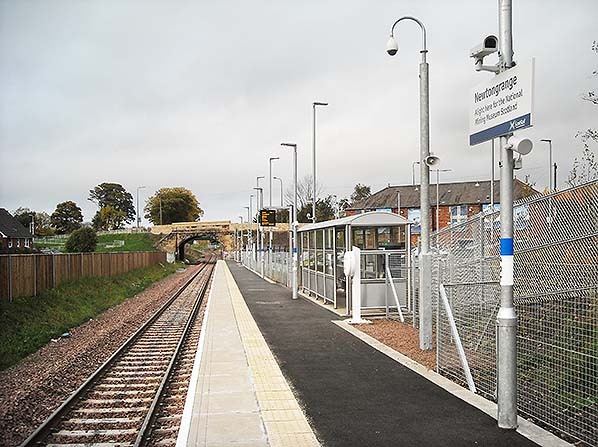 The style of metal mesh fence blocking access to the building can be enjoyed along much of the length of Borders Railway. 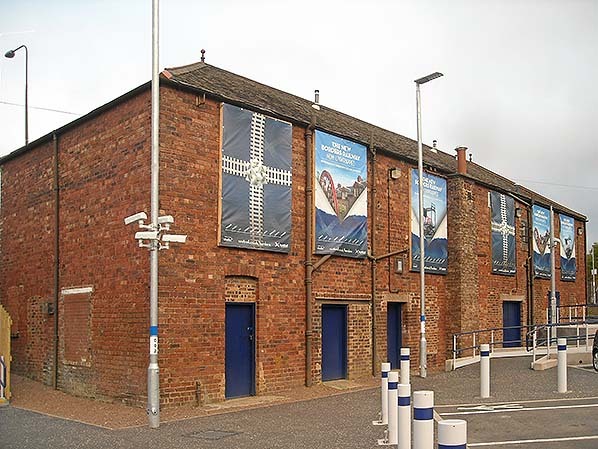 ScotRail uses the rear of the building to display advertisements concerning the reopening of the railway.